Four miles off Utah Highway 261 near Mexican Hat, you can look into a 1,000-foot-deep chasm carved through the Pennsylvanian Hermosa Formation by the silt-laden San Juan River. 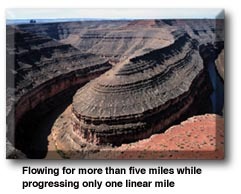 The river meanders back and forth, flowing for more than five miles while progressing only one linear mile toward the Colorado River and Lake Powell. The access road is paved. The Park encompasses 10 acres. Facilities include primitive camping and vault rest rooms. Open year round, 24 hours a day. There is no lodging available in the park. Check nearby towns for motels. Facilities include primitive camping and vault rest rooms. Elevation is 5,800 feet. 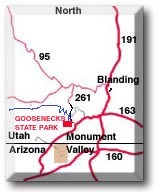 Maximum RV Length - 30 ft.
Reservations can be made by calling Utah State Parks and Recreation at 800-322-3770, from 7:00 AM to 6:00 PM, Monday through Friday. Individual campsite reservations may be made 3 to 120 days in advance. A $5 non-refundable reservation fee is charged for each site reserved. A $10 non-refundable fee is charged for group sites and building rentals. An additional reservation fee is charged for any changes to existing reservations. Visa, MasterCard and personal checks are accepted. A $5 fee is charged for an extra vehicle and is collected at the park. Picnicking is available in the Park. Mexican Hat, Utah: 8 miles east. Blanding, Utah: 61 miles north. Monticello, Utah: 82 miles north. Kayenta, Arizona: 52 miles south. Cortez, Colorado: 67 miles northeast. Shiprock, New Mexico: 118 miles east. Tuba City, Arizona: 100 miles southwest. Page, Arizona: 137 miles northwest. Monument Valley Tribal Park (AZ): 30 miles southwest. Navajo National Monument (AZ): 78 miles south. Natural Bridges National Monument (UT): 36 miles north. Mesa Verde National Park (CO): 113 miles east. Hovenweep National Monument (UT/CO): 73 miles northeast. Edge of the Cedars State Park (UT): 45 miles east. Lake Powell NRA (Bullfrog or Hite): 57 miles northwest. Lake Powell NRA (Wahweap): 85 miles west. Mule Canyon Ruins: 42 miles north. Butler Wash Ruins Overlook: 48 miles north.